This radical new approach to dealing with North Korea offers a refreshing perspective on an intransigent and deadly situation. Imagine you control a multi-billion dollar capital fund, and North Korea is an underperforming corporation. You see it is undervalued and want to take it over, but it is controlled by an old-fashioned board of directors—the Kim family and a small number of ultra elites—who will not negotiate a deal. In this regressive situation, it is logical to offer its shareholders—the political and military elites, government managers and bureaucrats, and the general population—a higher price for their shares to convince them to overrule their board of directors. 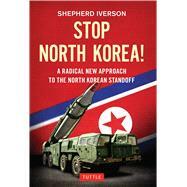 Stop North Korea! A Radical New Approach to the North Korea Standoff applies this basic scenario to a situation that has become dire, and for which a robust positive solution is crucial. This book shows how investment rather than constraint—the carrot rather than the stick—will not only deter the North Korea threat but enhance the global community in ways perhaps unimagined in the past. Shepherd Iverson is a professor at Inha University in Incheon Korea, where he has lived with his family for the past 8 years. He is also the author of One Korea: A Proposal for Peace (2013).